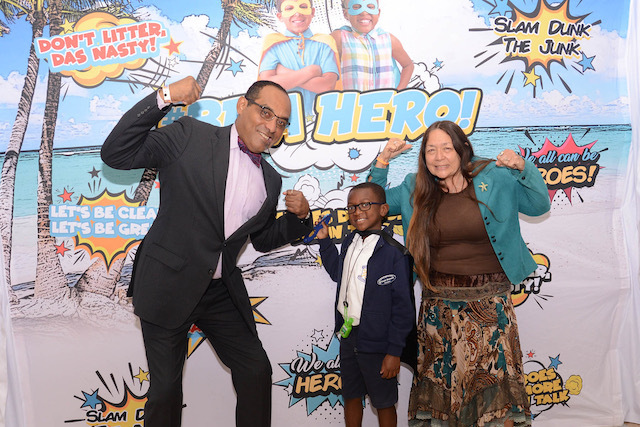 Three months after the first #BeAHero presentation took to an auditorium in Nassau with a message to hundreds of youngsters that no one is too young to take pride in a clean room, school or street, the popular caped crusader campaign went national this week – its first visit outside the capital fittingly in the nation’s second city, Freeport. 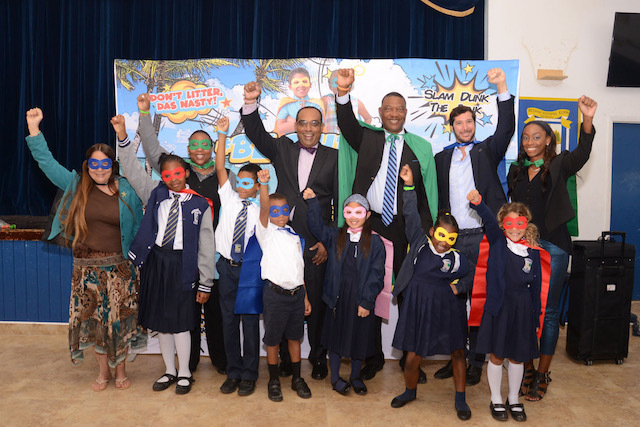 Minister of Environment and Housing Romauld ‘Romi’ Ferreira drummed up support for the cleaner, greener, safer communities’ initiative by challenging students at Bishop Michael Eldon Primary School in Grand Bahama. “Today is a very exciting day for me,” said Ferreira. 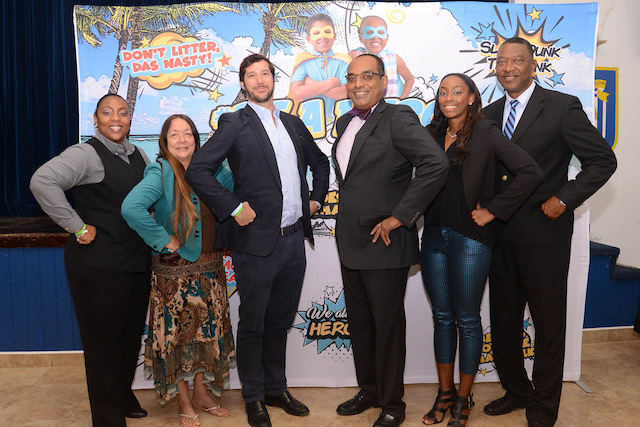 “I am so pleased to kick off the launch of the national #BeAHero campaign right here in Grand Bahama. The visit to Bishop Michael Eldon Primary was the 19th visit to a primary or junior high since the #BeAHero Team began delivering the anti-litter, take pride in your surroundings message, in a way that would appeal to students; complete with superhero capes, masks, backdrop and group participation. With national heroes like basketball greats NBA’s Buddy Hield and WNBA’s Jonquel Jones, track stars like Olympic Gold medalist Shaunae Miller-Uibo and Golden knight Chris ‘Fireman’, entertainers like Kirkland ‘KB’ Bodie and Wendy and Dyson Knight and civic leaders like Ed Fields and Nancy Kelly as models in the campaign, the minister and team challenge students to compete for their schools to win the right to replace hero images throughout New Providence and become heroes themselves by identifying and carrying out a clean-up and beautification project that makes a difference. Projects can be on school grounds or in communities with before, during and after photos posted on the campaign’s active social media platforms including #ReplaceTheHeroes Contest. Winners will be announced before the end of the school year. 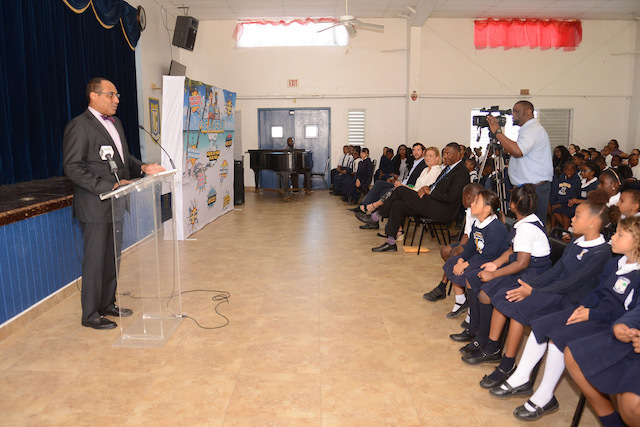 “This program was initially only intended for Nassau to instill in young people the message that this is their land and keeping it clean and green is their responsibility,” said the minister. “But when schools in Nassau started posting their projects on line, students from Abaco and Grand Bahama wanted to join and we welcome the opportunity to expand. We will take this nationwide and visit as many islands as we can. In Grand Bahama, local leaders and environmentalists turned out to show support for the first national extension of the initiative. Among them were Rupert Hayward, Executive Director, Grand Bahama Port Authority and its Keep Grand Bahama Clean Campaign, Rashema Ingraham, Executive Director of Save The Bays, and Gail Woon, President of Earth Care. Expenses of the program designed in partnership by Barefoot Marketing, Grand Bahama, and Diane Phillips & Associates, Nassau, have been borne in large part by corporate sponsors including The Tribune, AML Foods, Atlantis, Bahamas Wholesale Agencies, Bahamas Waste, Commonwealth Brewery, Kelly’s Home Centre, Seaside Media, Solomon’s, Subway, Bahamas Ministry of Tourism, Bahamas Ministry of Education and The Sign Man.